"When Thurston Came To Town"
On October 3, 2006, we here at www.ThurstonMasterMagician.com received a letter from William Rauscher with a cassette tape copy of his wonderful lecture "When Thurston Came To Town". In his letter he gave us full permission to add this lecture to the site. This meant a lot to have this great lecture on the life of Howard Thurston here on www.ThurstonMasterMagician.com, since we have always thought this would be something very special for the fans of this site and for people that admire Howard Thurston. In addition to the lecture on Howard Thurston, you will find at the end of the lecture an audio recording that Jane Thurston gave Bill Rauscher. William Rauscher told us "She had made this little vignette for her family but most are gone now and am sure you will find it touching and very nostalgic." It has been said that when William Rauscher presented this lecture he got repeated standing ovations and also had members of the audience in tears, due to the nostalgic aspect of this great lecture. 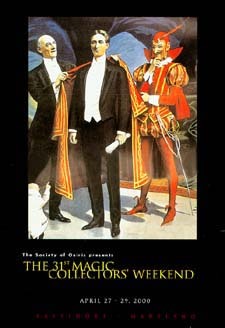 'A Summer Gathering Of Magical History' Sponsored by the New England Magic Collector's Association, Sunday June 24, 2001, Crowne Plaza Hotel - Worcester, Massachusetts. William Rauscher is a noted and award winning magician, author, historian, lecturer... and a truly great person. We would like to thank William Rauscher so much for allowing us to have this on the site and be the exclusive source for this great lecture. All Images & Videos Used In The Making Of "When Thurston Came To Town" Are From The TRFC And Cannot Be Used, Duplicated, Reproduced, Manipulated, Posted, Copied, Distributed In Printed Or Electronic Form Without Prior Written Permission From The Owner /Creator Of www.ThurstonMasterMagician.com, Rory Feldman. All Music Used In The "When Thurston Came To Town" Video Is Copyrighted And Cannot Be Used, Duplicated, Reproduced, Manipulated, Posted, Copied, Distributed In Printed Or Electronic Form Without Prior Written Permission From The Owner /Creator Of Said Music. All Audio Of William V. Rauscher And/Or Jane Thurston Used In The "When Thurston Came To Town" Video Is Copyrighted And Cannot Be Used, Duplicated, Reproduced, Manipulated, Posted, Copied, Distributed In Printed Or Electronic Form Without Prior Written Permission From The Owner /Creator William V. Rauscher. "When Thurston Came To Town" ™ William V. Rauscher. "When Thurston Came To Town" Lecture © William V. Rauscher.